CCP launches Eve players into space. Well. Kinda. In a way. Richard Garriott might have been the first gamer in space, but he wasn’t the last. The entirety of Eve Online’s subscriber base (as of midnight on December 31st 2011) almost joined Ultima’s creator up there, in a PR stunt like no other. Actually, that’s pure hyperbole. The much-vaunted Skyward Sphere sounds impressive but in fact it’s just an upper-atmosphere weather balloon carrying a replica Eve pod and data unit with the names and portraits of all the players. Whether it got into space or not is a matter of argument – it only hit the stratosphere. This certainly looks like you’re in space, if you get near to the mesosphere and is 50KM up – but bacterial life still survives up there, so it’s not the hard vacuum of space, which starts around 250KM up. Admittedly, it cost developers CCP very little to do, is nicely silly, and fits with the space-going theme of Eve. And perhaps it’s not a weather balloon, but Iceland’s attempt to escape the burgeoning global economy by colonising Mars. The photos certainly don’t make it look higher tech than T2 anyway. 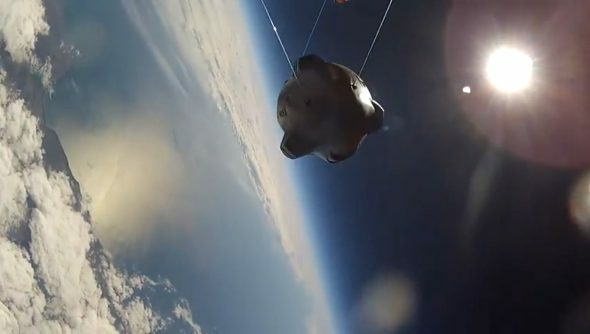 That’s not the end of the story though; CCP have another weather balloon left and are thinking of using it to send a scale Rifter into space. Given that they’re launching it with a Samsung Galaxy Note attached, you should be able to track the majority of the ascent safely from home. For more information, see the official Eve siteor follow the sphere on twitter.